Help others facing a cancer diagnosis or amputation for their dogs by spreading the word about all the helpful resources the Tripawds community has to offer. Download and print these fliers and cards, then put them up at local pet stores and ask your veterinarian or oncologist to give them to all their amputation patients. 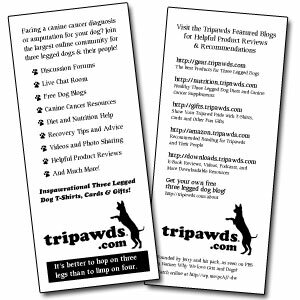 You can even give your vet a handy Tripawds Countertop Display to hold the business cards, and have the staff contact us for more cards or just have them print more out right here! Two sizes of black and white fliers and color cards are set up for economical printing. Fliers are available with three or four per page and can be printed single or double sided. Single sided color business cards are set up 10 per page with crop marks for easy cutting. Take the PDFs to your local copy shop and they’ll know what to do! Print the black and white fliers on bright colored paper and use white card stock for the color cards. 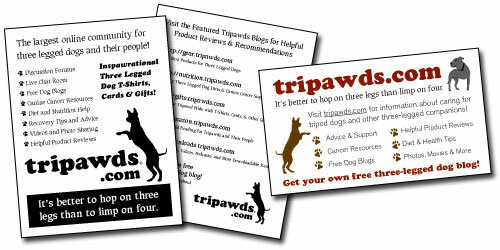 All these items include information about the Tripawds Blogs and discussion forums, where anyone facing the difficult decisions about their dog’s amputation will never feel alone. I have the biz cards you sent with Abby’s bandana. I put them in the little pack I take to the beach and will hand them out next time someone asks me about having a tripawd. I’ve had several people stop me and say “oh, my friend’s dog just became a tripawd” and I always tell them to go to your site. Will be much easier to just hand them a biz card! I’ll also take some to her onc’s office. Thanks for all you guys do Spirit Jerry and the Tripawd pack.